Almost all drivers run into inevitable, unwanted situations while they are on the road. Whether you are an experienced driver or are rather new to the driver’s seat, here is a list of items to always keep in your car! We encourage you to bookmark this page and refer back to it, particularly when getting ready for any trips where you will be driving your car! Paper towels and tissues – It’s never fun to spill anything, and it’s really a pain when it happens in the car. Ever spilled your coffee? Paper towels will help you clean up that mess. Tissues are good to have in case you get stuffed up in the car and need to blow your nose, or if you get a nosebleed while behind the wheel you will have a way to deal with it! Tire pressure gauge – This is useful to have to check your tire pressure. You should use one of these every few weeks just to check the pressure, or before heading out on a road trip. When filling your tires with air you can use the gauge to check the tire pressure as you are filling up the tire. Owner’s manual – Although many owner’s manuals are available online for free nowadays, you should still keep yours in your car. Your glove compartment is a great place for it. Want to know how to turn your high beams on? Having your owner’s manual there will help with learning how to do that! 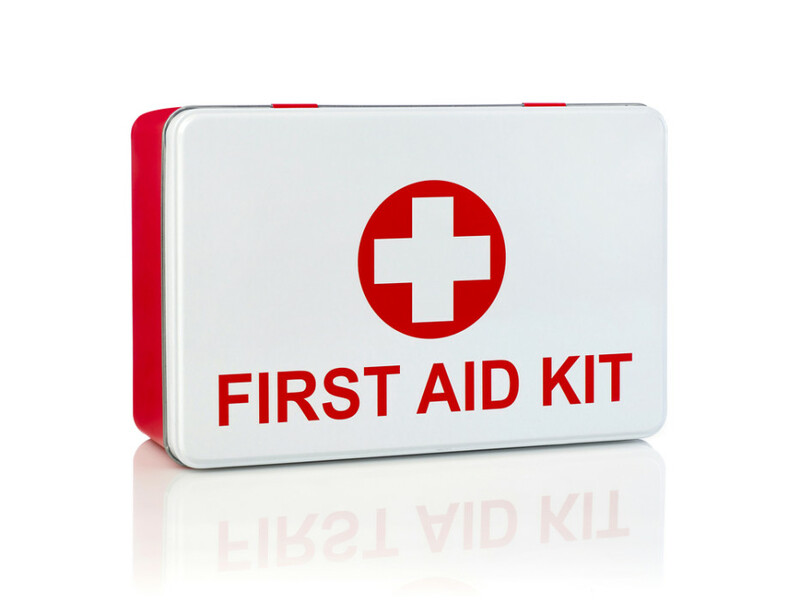 First Aid Kit – You never know when one of these may come in handy. You never know when a broken nail could happen or when you may get a papercut. Make sure your first aid kit has plenty of band aids in it! Comfortable walking shoes – Perhaps you have to dress up a bit for work and sneakers aren’t allowed. Well, keep those sneakers in your car in case you get stranded somewhere and need to walk a bit for help. Uncomfortable shoes really are not ideal for walking a long ways! Emergency money – Quarters in particular can serve this purpose, in case you have to use a parking meter or run into an unplanned toll booth. Ice scraper with snow brush – Perhaps you have gotten stuck at work with no easy way to get the ice and snow off your car. It is recommended that you keep one of these in your car to easily brush the snow off your roof and other areas of your car, and then you can scrape the ice off easily. A Traction Assistant – It’s never fun having your car get stuck in the winter when you are just trying to get going. That is why you should keep something in your car to help you out. In terms of your car’s payload it might be easiest to use old carpet remnants, or keep a bit of cat litter in the car (Mr. Whiskers won’t mind). The folks at Susquehanna Chrysler Dodge Jeep Ram in Wrightsville, PA, can give you additional ideas!